Bozomzeal Manor – Dittisham, Nr. Dartmouth, Devon. Bozomzeal Manor is a manor house dating back to the 1500’s and is situated on the banks of the River Dart at Dittisham in Devon. It is thought to be a former mansion. The house itself is steeped in history, before the Norman Conquest, the mother of Earl Harold owned the manor after which William the Conqueror took the estate for himself. A hundred or so years later it became part of the Barony of Harberton and later, in the 14th century, it was held by the Bozom family. In 1540 it passed to the Fulfords through marriage and they owned it for almost three hundred years. In the 16th century Captain John Davis lived at Bozomzeal Manor. He was famous for his attempts to find a north-west passage to China and also for discovering the Straits between Greenland and Baffin Island which bear his name today. Later again it became part of the Raleigh Estate and the descendants of Sir Walter Raleigh owned it up until the second half of the last century. It is Grade II listed by English Heritage. 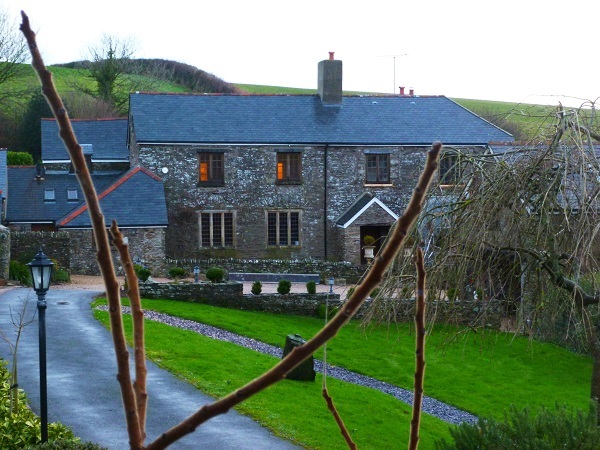 The client had contacted us concerning water penetrating through the stonework above three mullioned windows on the ground floor at the front of the property. Rainwater was tracking through the head of the window openings and dripping onto the internal window sills in the Great Hall below. Each window had ‘relieving arches’ built over the openings above the mullioned windows. These arches are designed to protect the delicate softer ‘Beer’ stone used to create the mullioned windows below them and protect them from movement and cracking, and they achieve this by transferring the stress above them down onto the reveals either side of the openings below. You see these types of arches in many churches as they protect the tracery windows which some contain priceless stained glass. They are also known as ‘discharging arches’. This method has been used for centuries and much favoured by the Romans. There is one used by the Egyptians in the Great Pyramid at Giza and is one of the earliest examples known. These relieving arches made our work a lot easier because it meant that we only needed to take out the stonework from beneath each arch down to the top of each window. The arch would support the stonework above and because of this we would not need to shore up the openings by means of props which can sometimes hinder you at the best of times and make working practices awkward. 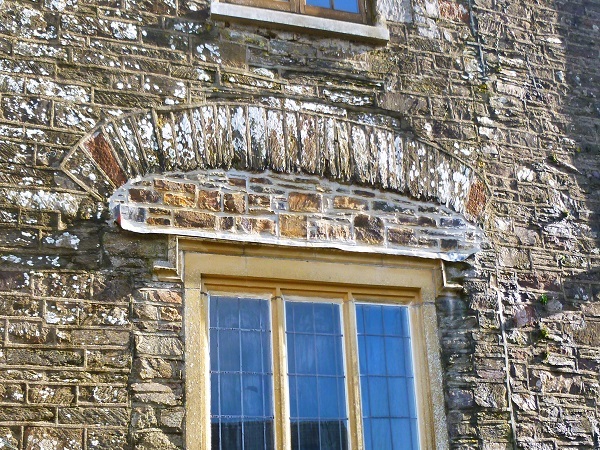 Once the stonework had been carefully removed, the existing stone was set aside for re-use. 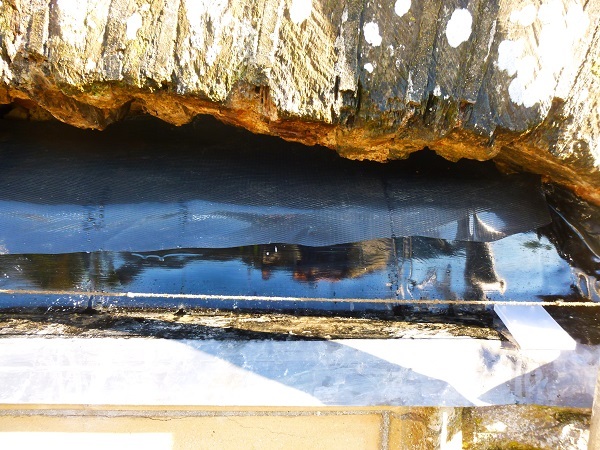 To prevent future rainwater tracking back to the inside, we then placed in new lead trays. 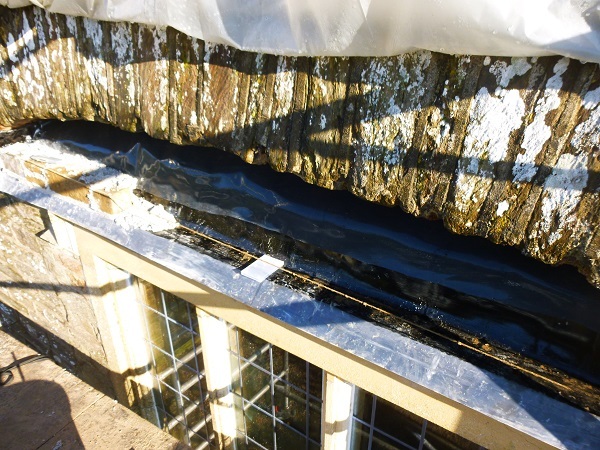 The lead goes back the full thickness of the wall and is turned up at the back and sides, whilst the front edge of the lead tray is dressed down slightly over the ‘Label Mould’ which projects over the front of the external window. This ensures that any water which penetrates the stonework can only come back out again and not through to the internal finishes. 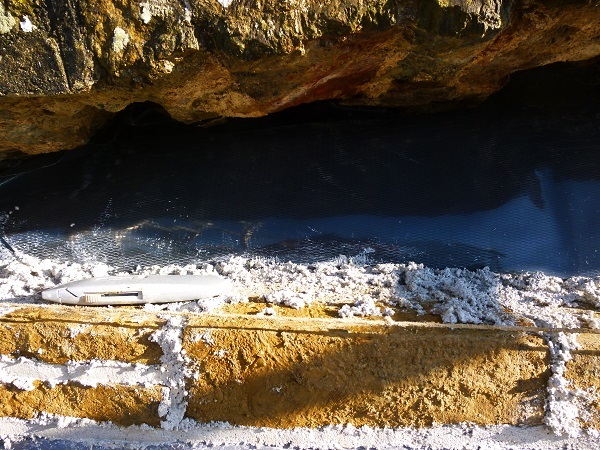 The lead is painted with a bitumen paint, this prevents any white leaching that can occur when the lime mortar used to re-instate the stonework re-acts to the lead and sometimes causes ugly staining. We also added an extra layer of black D.P.C over this again. Once the lead work was prepared and in place, the original stone was used to build it all back up again using a traditional lime mortar. After a couple of days the jointing to the stonework was finished off with a stiff ‘Churn’ brush, this exposes the coarse aggregate within the mortar and slightly recesses the joints to give a good finish overall. We carried out this process to all three windows. 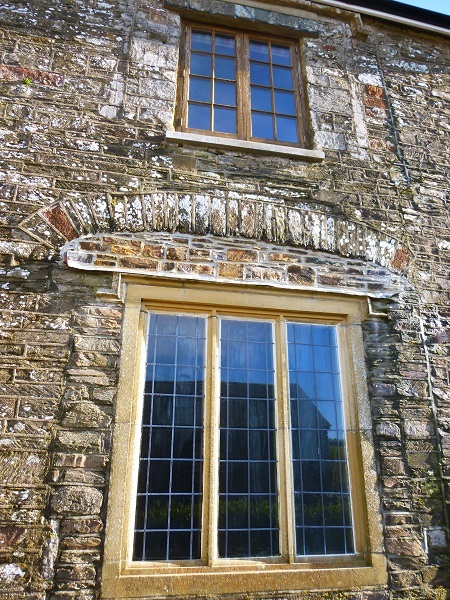 New slate sills were added to the upstairs windows. Bozomzeal Manor is situated along ‘Fire Beacon Hill’ so named because of the nearby fire beacon here. 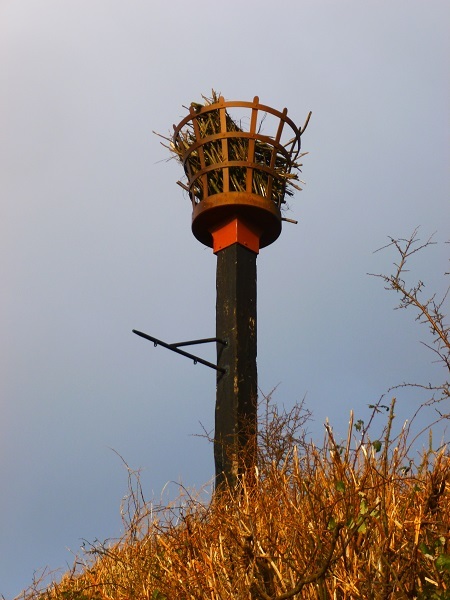 Beacons, or fire beacons, were fires which were lit to give warning to local people of the approach of an enemy. They were sited on high hills, usually as part of a defensive signal system, or chain, stretching back from the coast to inland areas. The signal was given by smoke during the day and light by night. Upon seeing the signal, men from the countryside round about would gather together and march to defend whichever coastal landing place was threatened. These signals travelled fast and Devon’s long coastline made it vulnerable to attack. Eighty-nine beacon sites are believed to have existed here, dating from the Roman period through to the Napoleonic wars.